KIEV, Ukraine -- A Ukrainian military pilot blamed by Russia over the 2014 downing of Malaysian Airlines flight MH17 has killed himself, Ukrainian media report, quoting police. Captain Voloshyn pictured at Mykolaiv airbase in 2016. Capt Vladyslav Voloshyn had called the Russian allegation a lie. Dutch investigators concluded that a Russian Buk missile had destroyed the Boeing 777 jet, killing 298 people. Reports say Voloshyn shot himself at home in Mykolaiv, near the Black Sea. Ukraine described him as a war hero. He had flown 33 combat missions in a low-flying Su-25 ground attack jet against Russian-backed separatist rebels in eastern Ukraine, and had been granted a medal for bravery. Recently the 29-year-old had been in charge of the Mykolaiv airport, after resigning from the air force. The southern city near Odessa is called Nikolayev by Russian speakers. A statement from Mykolaiv police on Facebook (in Ukrainian) described Voloshyn's death as "suicide", but it is being investigated under the "premeditated murder" section of Ukraine's penal code. A military service pistol was found at the scene and is now being examined by experts. The airliner, with 298 passengers and crew, was shot down on 17 July 2014 over war-torn eastern Ukraine. More than two-thirds of the passengers were Dutch, flying from Amsterdam to Kuala Lumpur. After pro-Russian rebels launched their insurgency in April 2014 several Ukrainian jets were shot down by them, yet many international airlines continued flying over the conflict zone. MH17's high-altitude flight path was thought to be safe, despite warnings about the rebels' missile capability. Russian officials not only alleged that Voloshyn's plane had shot down MH17. According to another Russian theory, it was a Ukrainian military Buk missile - no longer in service in Russia - that downed the airliner. Independent experts - besides the Dutch-led team - rejected the Russian claims, saying the evidence pointed to a Buk fired by pro-Russian rebels or a Russian military unit. The Joint Investigation Team (JIT) wants to put the suspects on trial in the Netherlands, but that is fraught with legal difficulties. Ukrainian and US intelligence sources said the Buk system had been sent into rebel territory by Russia, then moved out again. Family members quoted by Ukrainian media said Voloshyn had been feeling depressed. They were in the flat when he shot himself on Sunday and his wife heard the shot. An ambulance was called but he died in hospital. 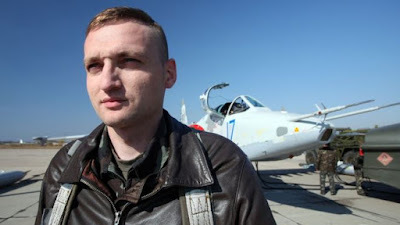 A Ukrainian journalist who knew Voloshyn well, Yuriy Butusov, praised him on Facebook as an exemplary pilot who had fought bravely against the Russian-backed rebels in the Donbass region. Butusov expressed bewilderment over Voloshyn's death. "Dear Vlad, how can this be?! Why?!" he wrote. "He didn't let himself break down, he wasn't depressed at all - he always acted as an exemplary officer." According to Butusov, Voloshyn had bombed Russian paratroops during the battle of Ilovaisk in August 2014, one of the bloodiest in the Donbass conflict. More than 300 Ukrainian soldiers died in the fighting there. Voloshyn was shot down but ejected from his Su-25, and reached Ukrainian lines despite severe injuries, Butusov said. "I didn't hear him speak of any enemies or unresolved problems," he wrote, adding that Voloshyn was happily married and adored his wife, his little boy and two-year-old girl.